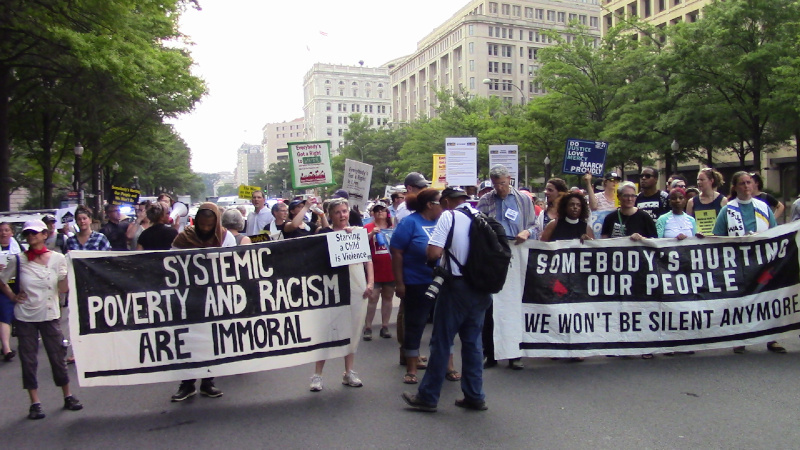 On the 18th of June, the Poor People's Campaign abandoned Capitol Hill protests. Instead, they marched from a big tent on the Mall and broke into three sections. The march sections went to EPA, HUD, and HHS. 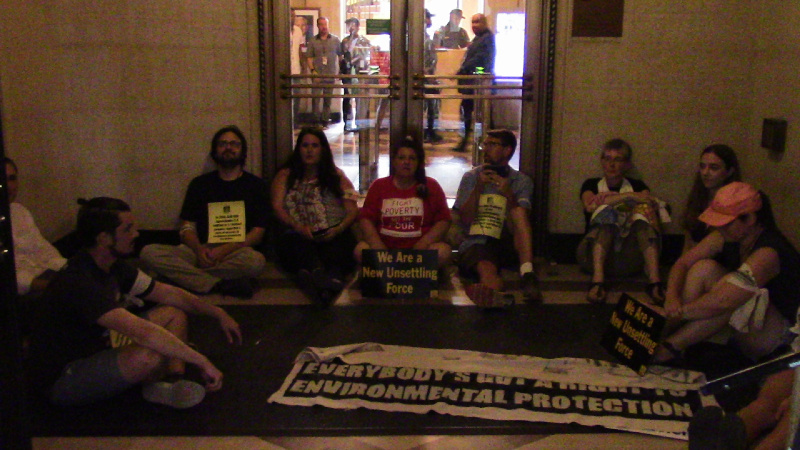 The EPA and HUD got blockades, while HHS has barricaded protesters out. 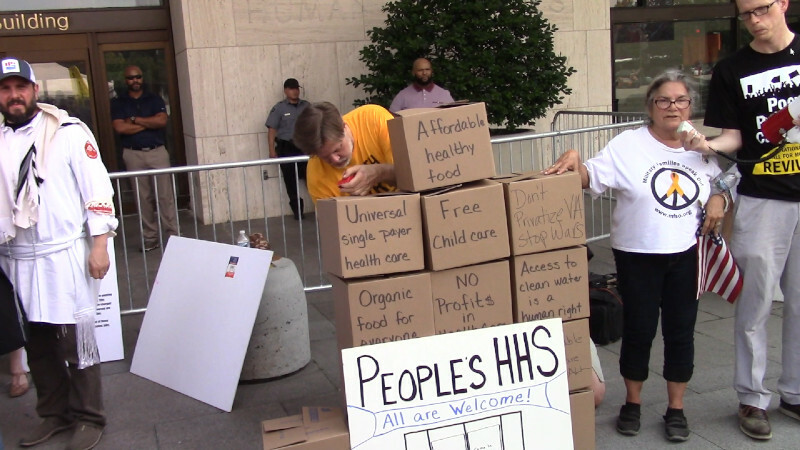 A "People's HHS" was erected at that location. In all cases cops declined to make arrests, so protesters escalated to street blockades and a final blockade at the Dept of Injustice. HHS is Health and Human Services, EPA is the Environmental Protection Agency, and HUD is Housing and Human Services. All have Trump flunkies in charge. At both HHS and HUD one of the issues is Trump's effort to raise rent by 20% for everyone who gets Federal housing assistance. At the EPA safe water was a major issue. Water is indeed life, and the Trump regime is not afraid to poison water from Flint, MI to Standing Rock, ND if there is money to be made by doing so. The previous week, Reverend Hagler and several other preachers were arrested for praying on the steps of the Supreme Court and held overnight. Upon release they spoke to the press, leading to a story on of all places FOX News about the cockroach infestation at Central Cell Block. For some reason the matching bedbug infestation went unmentioned. Unknown if that was FOX News pulling punches or the Poor People's Campaign saving the bedbug complaints for Round II. In any event, it was cheaper for police to submit to the doorway and rush hour traffic blockades than it would be to deal with the roaches and the bedbugs at Central Cell Block. 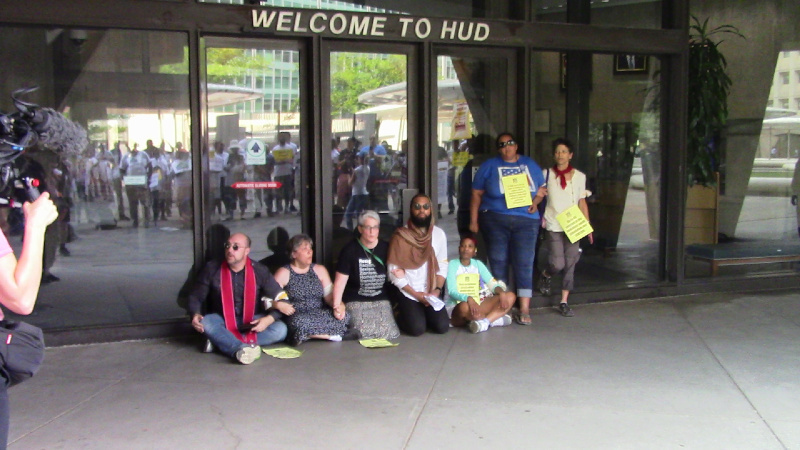 The street blockades were set when cops did not arrest blockaders at HUD and apparently not at EPA either though that is not directly confirmed. Marchers leaving HUD blockaded 7th st at the SE-SW Freeway, then moved to Independence Ave and linked up with protesters marching back from HHS. Finally all protesters came together in a march to the Dept of "Justice," home of Jeff Session. Attorney General Jeff Sessions is so blatantly racist that his confirmation for a seat on the Federal bench failed during the 1980's, on the grounds that he was too racist for Senate Republicans. Now this known KKK sympathiser is the man behind the "zero-tolerance" campaign of charging all migrants caught at the US-Mexico border and separating them from their children. Sessions was challenged to come out to speak to protesters but did not appear. Again police declined to make arrests, and eventually everyone marched back to their starting point. 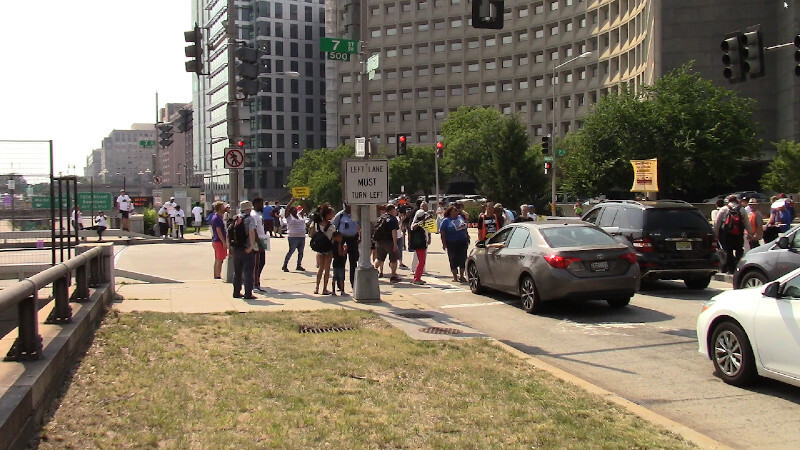 When asked about who was driving in traffic "in-car-cerated" behind the blockades, someone at the protest said that almost all the drivers on Penn Ave were wealthy, upscale drivers. When asked about service workers in those hugely expensive buildings they replied that all the service workers ride Metro. No Metrobuses were seen stopped at any of the blockades. It makes sense that the bulk of the traffic in afternoon rush hour in that part of town would be made up of those who can afford to spend $20-$25 a day to park their cars. Anyone who can afford to spend $25 a day to park their BMW can afford to wait behind a protest and get some education about those who are less well-off in the process! 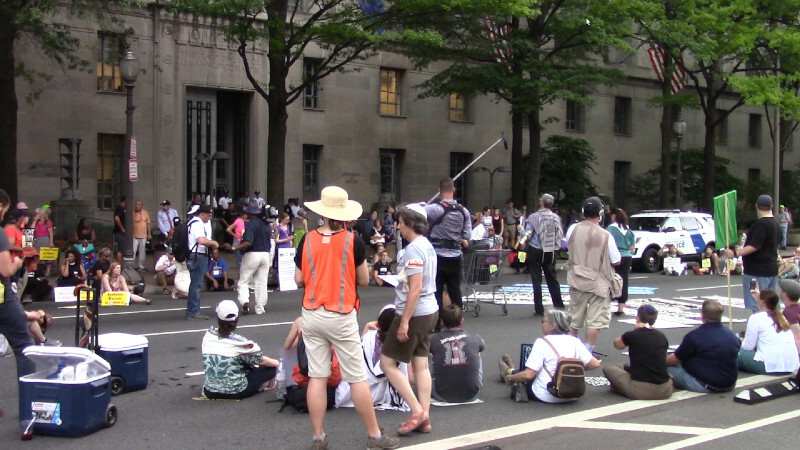 The final blockade on Penn Ave in front of the Dept of "Justice"